One of the two apprentice jockeys who died after an arson attack at a block of flats has been named by his family as 18-year-old Jamie Kyne. A man has been arrested over the fire which occurred during a party at Buckrose Court in Norton, near Malton in North Yorkshire. Mr Kyne's aunt said: "The family are devastated and Jamie was a star." The mother of jockey Jan Wilson, 19, said she was waiting for confirmation her daughter was the other victim. 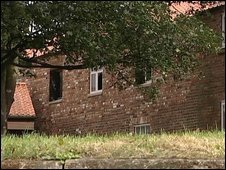 North Yorkshire police said they were not in a position to confirm the identities of the victims. However, friends of Jan Wilson posted tributes on her Bebo webpage. One wrote: "I am so proud of you for following your dream, you did it, you did become a jockey. I will never forget you, rest in peace." Miss Wilson of Forfar, enjoyed the third adult victory of her career at Ayr races just four weeks ago. Following the fire, two other men were taken to hospital. One of them, apprentice jockey Ian Brennan, 20, had jumped to safety from the third floor of the building. He has since been released from York District Hospital. The injuries of the other man are not thought to be life-threatening, police said. Mr Kyne's aunt said of his parents: "They are so proud of him. At the moment they are just devastated and shocked." Mr Kyne had been due to ride at Haydock on Saturday. He was lying third in the apprentice jockeys' championship, having had 29 winners this year. The Kyne family run Kiltrogue stud farm in Claregalway, County Galway. Horse trainer Adrian McGuinness, from Lusk, County Dublin, said: "He was very good, one of the best young riders about and probably one of the top apprentices in England at the moment." On Saturday Thirsk and Kempton racecourses observed a period of silence as a mark of respect to the victims. Jockeys at Stratford wore black armbands and York racecourse was flying its flags at half-mast. The bodies of the victims remained in the building as emergency services worked to make it safe to enter. Eyewitness Will Spowart described watching the flames grow in intensity until the windows blew out and a large blue gas flame shot out of the upper storey. "It was awful. The place was just in flames", he said. 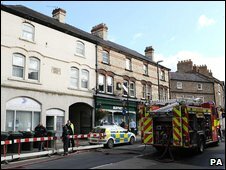 The landlord of a nearby pub, Steve Kinsella, said: "I just heard someone shouting. So I looking through the window and saw a girl just running in the street. "All she had on was a T-shirt. She was shouting 'Fire, fire', screaming at the top of her voice."